Antenna problems can occur across any suburb of the Gold Coast, however many of the antenna problems in Coombabah often come from unit blocks and complexes where two or more units are sharing the same television antenna. More often than not, this leads to issues with one resident not receiving great service while the neighbour’s TV is fine. One other issue that often pops up is that the television signal is fine during certain times of the day but not during others, or that some channels work while others don’t. If you live in Coombabah and are suffering from a television signal that doesn’t quite work properly, what can you do? For those living near the Coombabah Reserve, your signal could be interrupted by a large number of trees in the area. While Coombabah residents shouldn’t have an issue with receiving a good signal, these trees are often one cause. 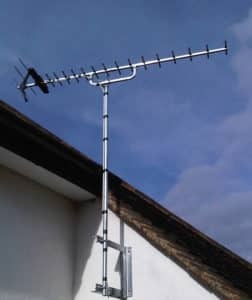 One way to get around this is to install a new antenna – one that is slightly larger or stronger to help get through the disturbances from the tress. The other option is to install a masthead amplifier. These amplifiers are made for areas where the signal is interrupted. We wouldn’t recommend just going and buying a masthead amplifier and installing it yourself though. If this isn’t the issue, you can make your signal worse. Coombabah is home to a large number of complexes, low-rise unit blocks, and duplexes. Many of these properties share an antenna between two or more units which can cause plenty of problems, especially if one party is running more than one television. A distribution amplifier may be the best option in this circumstance. A distribution amplifier simply takes the one signal and pushes it out to multiple televisions without losing signal quality. These amplifiers can be installed quite easily and relatively quickly ensuring you have your television signal back. Another common antenna problem in Coombabah is simply the antenna, or the leads, needing replacing or repairing. If the antenna is rusting and the leads starting to split, you will likely need a new antenna. Alternatively, if your antenna has been moved around during high winds or a storm, you may just need to have the antenna reset to be pointing towards the Mount Tamborine broadcast tower. Living in a complex or low-rise unit block can be tricky when it comes to getting good television signal if the antenna hasn’t been set up correctly in the first place. 4If you’re having issues with your signal or antenna in Coombabah, call Mantas at Home Style Antennas. With a 10% discount to all new clients, Mantas has your common antenna problems in Coombabah covered.